Christ the Redeemer is a statue of Jesus Christ in Rio de Janeiro, Brazil. 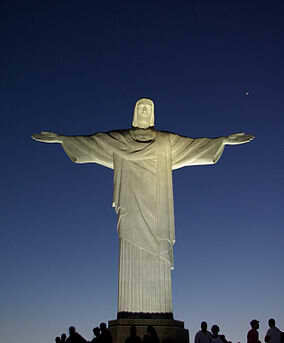 It is the largest Art Deco statue in the world, the world’s 5th largest statue of Jesus Christ and one of the New Seven Wonders of the World. It is 130 feet tall, including the 31 foot pedestal, and 98 feet wide and weighs 635 tons. The statue is located at the peak of the 2,300 foot Corcovado mountain in the Tijuca Forest National Park which overlooks the city. 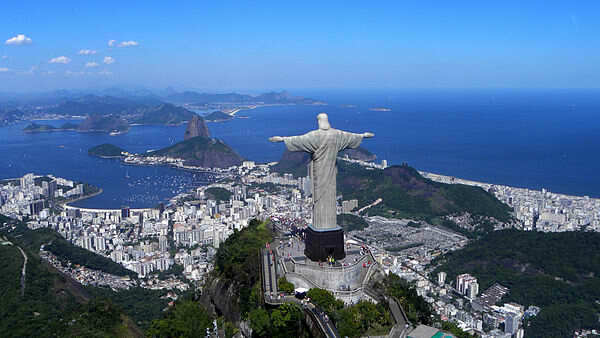 The statue is a symbol of Christianity and has become an icon of Rio and Brazil. The Christ the Redeemer statue was designed by Heitor da Silva Costa and sculpted by French sculptor Paul Landowski. Construction took nine years (1922 – 1931) and cost the equivalent of US $250,000 ($3,068,097 in 2011 $$). It was sculpted of reinforced concrete and soapstone. The monument was opened on October 12, 1931. It is accessed by a short railway trip or by climbing the 222 steps.